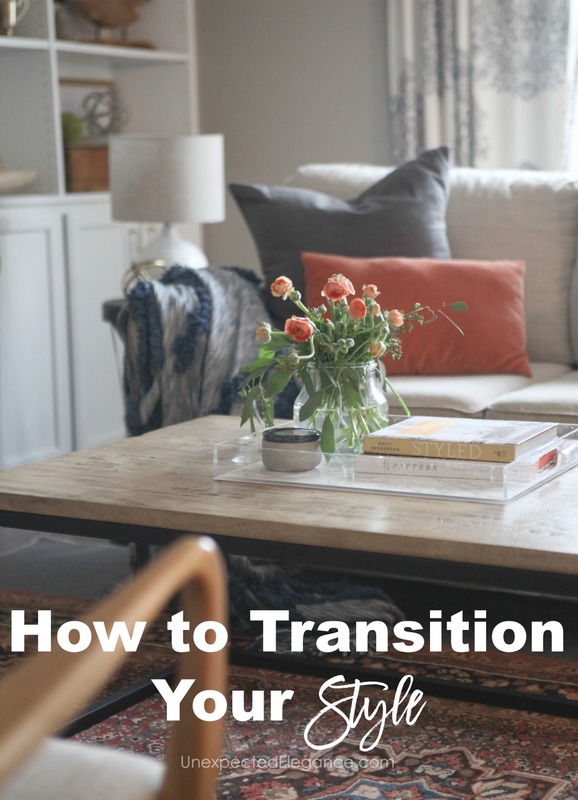 How to Transition Your Style Seamlessly in your Home Right Now! Get some tips and tricks on how to transition your style when your taste has changed. Practical ways to spend less and get the look you want. Let’s face it. We all get tired of the things we used to love. 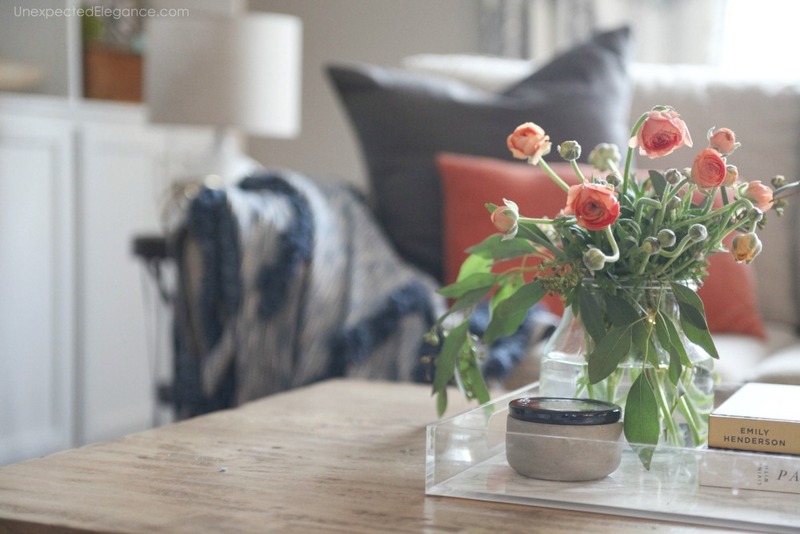 I don’t know about you, but this time of year I start to transition my style and update my spaces. You may have loved having a modern look in your living room, but have decided that it doesn’t feel as cozy as you would like. Or you may decide that you want to add a farmhouse look to your kitchen. First, you need to think about what you want your room to look like. For example, if you want your living room to feel cozy and comfortable, think about what pieces would make that happen. Do you want to add a fireplace to the room or purchase new furniture? Do you want your kitchen and dining room to have a farmhouse look? Think about which elements would make that happen. It might be as simple as wall décor! Just think about what pieces you might need to achieve that look. The next thing is you want to do is start with a clean slate. Remove all the items from the room, except for the pieces that you know you’ll be keeping, such as your couch or bedroom furniture. This means accessories, curtains, pillows, rugs, etc. Once your room is completely cleared, you’ll be able to better see your room and how you want it to look. Once you’ve removed the pieces from your room, look at them closely. Do any of the pieces match the new look you’re going for? Could any of the pieces be transformed to match the new look? For example, if your throw pillows are in great shape, consider buying covers for them that will match the new look. Also, spray paint can do wonders to transform accessories to match your new look. You know this is my favorite tip! I love getting creative. Being crafty can allow you to transform pieces you already have. For example, you might decide to stain your furniture another color or spray paint your accessories. You might also decide to make new accessories and furniture for your home. YouTube has so many awesome DIY videos for making home décor items. Last, but not least, purchase new items slowly. Don’t go out and spend $1000 on new accessories and furniture in one weekend. There’s something magical and special about finding the right pieces for your home. You might find just the right lamp for your new look at a thrift store or a new dining room table at a flea market. Taking your time ensures you find pieces that you absolutely love; not just pieces that fit the look you’re going for. The BEST part is that your room will look collected and special. If you’re tired of the way your room looks, makes some changes! You don’t have to spend a lot of money to get a new look in your home. You also don’t have to be stuck in a design rut. Explore new options and create a room that you love.